Today, we’ll talk about a company that showcased the amazing torch relay at the PyeongChang Winter Paralympics. The company, SG Robotics, is committed to robot research to help disabled people who are paralyzed from the waist down and the elderly walk more easily. Let’s hear from Na Byung-hoon, senior researcher at the company. For the first time in the world, a disabled person using a wearable robot manufactured by SG Robotics carried the Olympic torch at the PyeongChang Paralympic Games. The wearable robot named “WalkOn Suit” won the bronze medal in the exoskeleton wearable robot category at Cybathlon in 2016 to gain international recognition. Cybathlon is the cyborg Olympics. 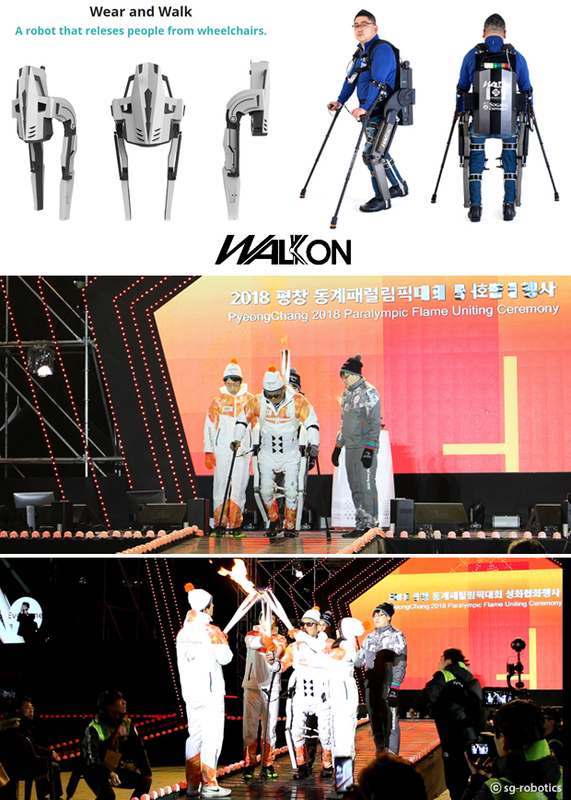 The recent torch relay also demonstrated Korea’s robot technology globally. I believe the scene of the torchbearer using the wearable robot gave hope to countless people who have similar walking disabilities. The PyeongChang Winter Paralympics came to an end on March 18. Before the ten-day heated competition, the Paralympic flame traveled a total of 2,018 kilometers. Lee Yong-ro served as the first torchbearer using “WalkOn,” along with Sogang University professor Kong Kyung-chul, who developed the wearable robot for those with lower limb paralysis. Mr. Lee hasn’t been able to stand or walk since he had an accident in his 20s. But as the torchbearer, he walked for himself and delivered the flame to the second torchbearer, impressing onlookers. The WalkOn Suit is a wearable robot for disabled people with complete paralysis. With it, users can walk on flat surfaces, slopes and stairs. The robot ensures safe walking in consideration of the range of human joints and the revolution speed. It weighs about 30 kilograms and users can wear it for four hours consecutively. Users can keep the robot’s balance by using a special stick. They can control the robot with a switch that is installed on the stick. When they press the switch, WalkOn takes a step forward. When they press it again, the robot takes another step. Users can also use the switch to select different modes, such as going up slopes or stairs. WalkOn was designed based on knee, ankle and foot orthotics that are securely affixed to the user’s body. It boasts driving force of 250-Newton meter, the highest power among equivalent models, and a speed of up to 45 RPM (revolutions per minute). It moves joints by combining many small motors to enable users to walk on flat surfaces, stairs and slopes and even to cross stepping stones. In 2016, WalkOn came in third in the exoskeleton wearable robot race category at Cybathlon, which was joined by global players, including Ottobock and an American robotics research institute supported by the National Aeronautics and Space Administration or NASA. 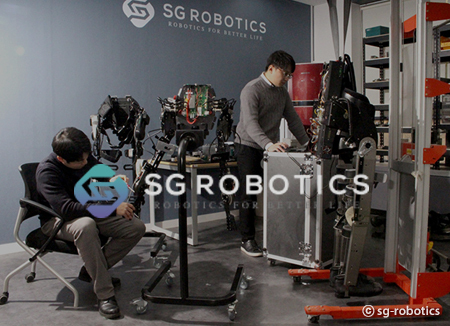 SG Robotics was established in February 2017, based on technologies secured by the Robot System Control Lab in the Mechanical Engineering Department of Sogang University and the Severance Chiropractic and Rehabilitation Center. The previous year, the two institutes carried out joint research as they became interested in wearable robots that would help those who have difficulty walking without assistance. To develop more functional robots, we launched SG Robotics. The company started from the Robot System Control Lab at Sogang University. Mechanical engineering professor Kong Kyung-chul, who is in charge of the lab, is a renowned scientist in the wearable robot field. He became an associate professor at Sogang University in 2011 when he was 29 years old. After a French college asked him to make a wearable robot for test purposes, he began to manufacture robots. The development of robots for rehabilitative purposes started in earnest with the participation of the Severance Chiropractic and Rehabilitation Center. The result was the creation of WalkOn, which proved the team’s technology at Cybathlon in 2016. The following year, SG Robotics was set up. Young researchers at the company unveiled the second wearable robot in 2017. 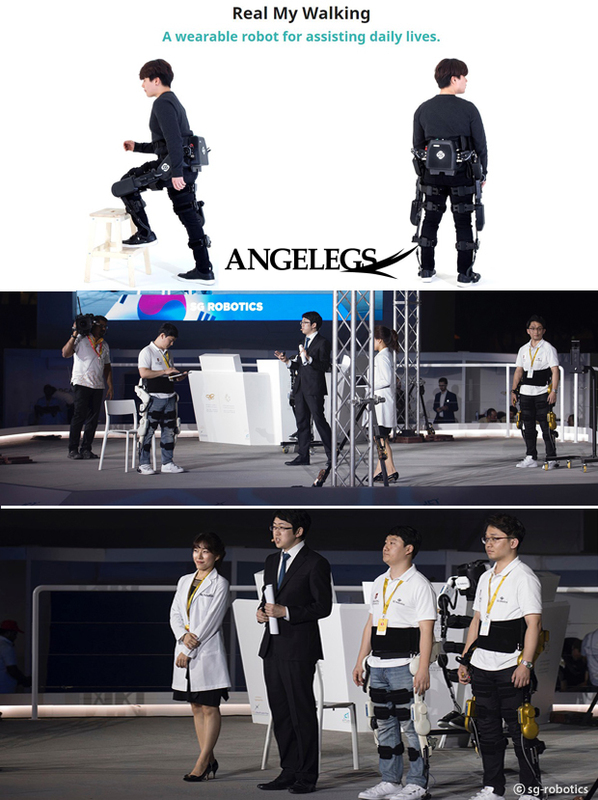 “Angelegs” is a light wearable robot that adopts a non-resistance drive mechanism. It was developed to support people with partial disabilities or the elderly with weak muscles. Since the users can move in some way, it is important to figure out their intention. The new robot has an automatic motion recognition function. For example, when users begin to walk, the robot recognizes their intention and helps them stretch out their legs more easily. When the users stop suddenly or make other movements, the robot doesn’t hinder the process but facilitates their movements. Many firms have developed robots for patients with complete paralysis, but when it comes to robots for people with muscle weakness, SG Robotics’ Angelegs is unrivaled. It became the only Asian entrant to reach the final of the UAE Robotics for Good Awards in Dubai in 2017. The company plans to commercialize Angelegs in the first half of next year. Afterwards, it will also develop assistant robots for child patients and laborers. Our company hopes to create and share social values through robots to contribute to creating a world where everyone is happy. We’ll make robots, strictly from the perspective of users, not developers. For users, robots represent amazing technology but should also serve as a daily necessity. That’s all the more reason why they should be developed from the perspective of the users. By using robot engineering, SG Robotics develops the technology of boosting people’s physical abilities. The company is bringing the world of humans and robots living together closer to reality, giving hope to people with disabilities.